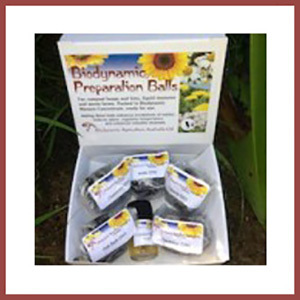 Biodynamic Preparation Balls consist of the 5 solid compost preparations –Yarrow (502), Chamomile (503), Nettle (505), Oak Bark (506) enclosed in 15g Manure Concentrate Balls and a vial of liquid Valerian (507) – plus Eggshell and Basalt. The aim in composting is to recycle manures and organic wastes with minimal loss of carbon, nitrogen and nutrients. Composting not only involves decomposition, it is a transformative process that builds nutrients into large, stable compounds and stores them.To support this process, Biodynamic Agriculture Australia Ltd makes large quantities of preparations which are ready for use.